Top 10 best One Piece arcs – One Piece is a manga series created by Eiichiro Oda. It also adapted into anime series and still running to date. This series known as one of the best Japanese manga series of all time. The story of One Piece is about the pirates world when pirates crew around the world travel a sea called Grand Line to find One Piece, a greatest treasure left by the late Pirate King, Gol D. Roger. The main characters of the series is Monkey D. Luffy and his pirate crew – Zoro, Nami, Usopp, Sanji, Chopper, Robin, Franky, Brook, Jinbei. The story of One Piece can be divided into two category, before timeskip (covering story in the first half of Grand Line) and after timeskip (covering story in the second half of Grand Line). Furthermore, One Piece’s story can be broken down into each story arcs. Story arc is the a smaller storyline that is a part of the whole. In One Piece, we can distinguished each story arc based on each island or place. For example, Alabasta arc, Water 7 arc, Dressrosa arc, Zou arc and so on. Here are list of One Piece arcs in order, from beginning to latest arc, only show canon arc based on manga, excluding One Piece filler arcs. There are more than 30 canon One Piece arcs episodes. Some of them is very short such as Romance Dawn arc (3 episodes) Reverse Mountain arc (2 episodes) and Whiskey Peak arc (4 episodes). But other is very long such as Dressrosa arc (117 episodes), Fishmand Island arc (51 episodes) and Thriller Bark arc (47 episodes). Some One Piece arcs was very good that fans really like. So what is the best One Piece story arc to date? Here are out pick of top 10 best story arc in One Piece manga series (canon-only) ranked from the first arc to the latest arc. 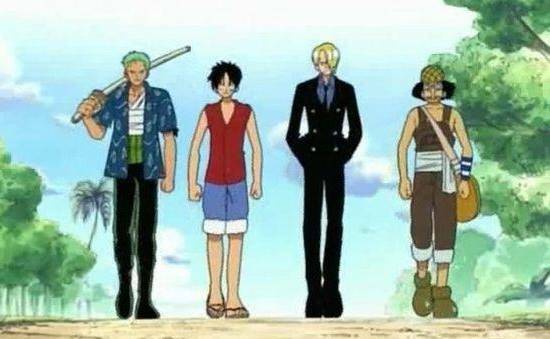 What is best arc in One Piece? Some people may say Marineford arc, but for us, Enies Lobby arc is the best. This arc easily can be descriped as series defining arc. 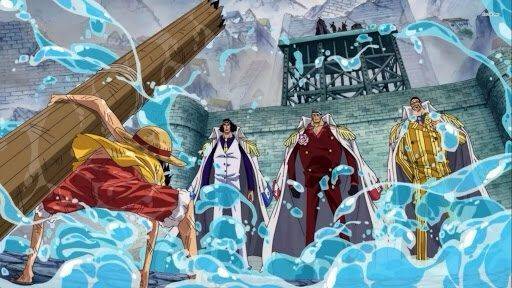 Enies Lobby arc is the continuation from Water 7 arc. Its story about Strawhat Pirates effort to save Nico Robin with help from Galley LA and Franky Family who want to save Franky too from CP9. Too many memorable moments in this arc. From Sogeking burn World Government flag, Robin’s ‘I want to live’, Chopper monster appear for first time, Nami strategic battle, Zoro vs Kaku, Luffy epic fight against Rob Lucci, Sogeking prep-talk to Luffy and the great escape with Going Merry. This arc closed sadly with the burial of Going Merry. Who doesn’t love Marineford arc? 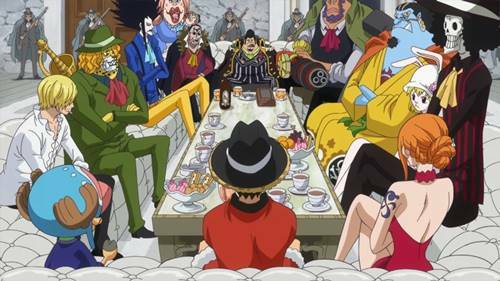 A grand arc revolves around war between biggest force in the world (Marine) against biggest pirates crew at that moment (Whitebeard Pirates) with a little help of Shichibukai and Impel Down ex-prisoners. And Luffy at the center of it. 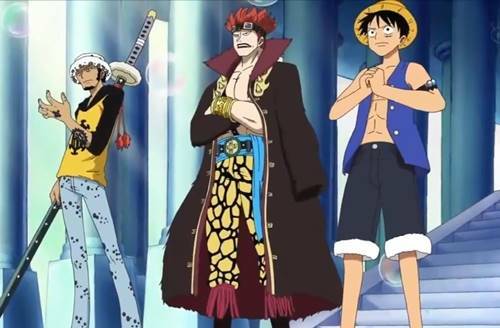 And there are three infamous pirates who join the party at the latter stages (Blackbeard, Shanks, Trafalgar Law). 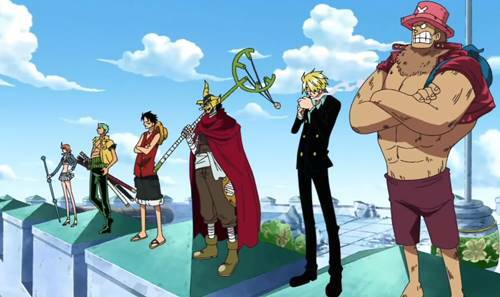 Sure we don’t see other Strawhat crew beside Luffy. But we still have full-pack of actions. The entrance from Luffy and co. was hilarious. The battle against Three Admirals was great. The death of Portgas D. Ace was sad. Whitebeard last speech was amazing. And the moment Shanks stop the war is just too epic. All happen in one arc as the closing of first half of One Piece stories before the timeskip. One of the best One Piece arcs or even one of the best anime arcs in a whole. Dressrosa arc have mixed review from fans. Many fans who complaint that this arc is too long (after all, Dressrosa arc is the longest arc in the series to date). But above all, Dressrosa arc is a good arc, or even great. 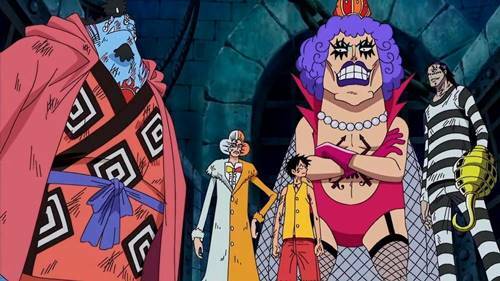 There are many new characters introduce in this arc, from new Marine Admirals, Donquixote Family crew, Dressrosa Kingdom member and Colosseum Fighters. Sure it’s very long, but the end is very satisfying. 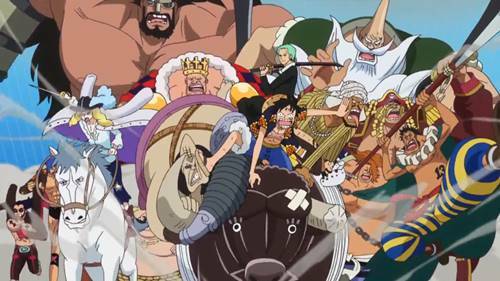 We see Strawhat Grand Fleet formed with 7 captain in each division – Cavendish, Bartolomeo, Don Sai, Ideo, Leo, Hajrudin, Orlumbus. Their bounty also risen up too. And don’t forget, this arc is responsible to create new epithet for Usopp, who currently known as God Usopp. A fan-favorite, Skypiea arc is one of the best One Piece arc. This arc is happen at Sky Island, so all events is unknown to Blue Sea resident (a.k.a people in the world). Many memorable moments in this arc, one of the highlight is battle at the upper ruins between four sides, Zoro, Gan Fall, Wiper and Ohm. 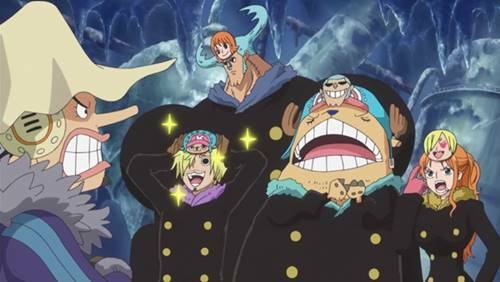 We also saw a lot of funny moments in Skypiea, including Luffy’s imitation of Sanji, Luffy’s baka song, Zoro interaction with the South Bird, Luffy eaten by giant snake and of course, ‘that’ hilarious face of God Enel, knowing his thunder power doesn’t work well to Luffy. Sabaody Archipelago arc, who can forget this arc? This arc is the bridge between before and after timeskip. In this arc we got many awesome moments, most notably is the arrival of 11 Supernovas at simultaneous time. 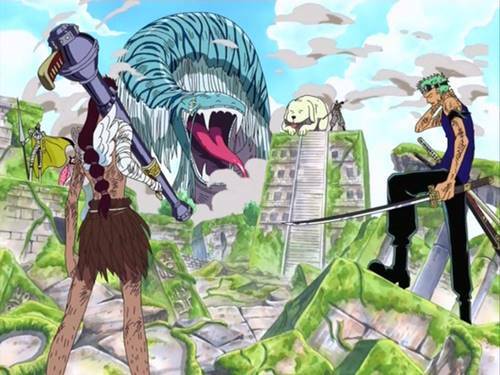 Kizaru and Pacifista along with Rayleigh is other notable characters introduced in this arc. Of course, people will remember this arc as the day the Strawhat lose. Yes, at the end of the story arc, we see that the ‘real’ Batholomew Kuma beat all of Strawhat crew (later we know that it is for good reason). But the most iconic moment in this arc is Vivi’s farewell. 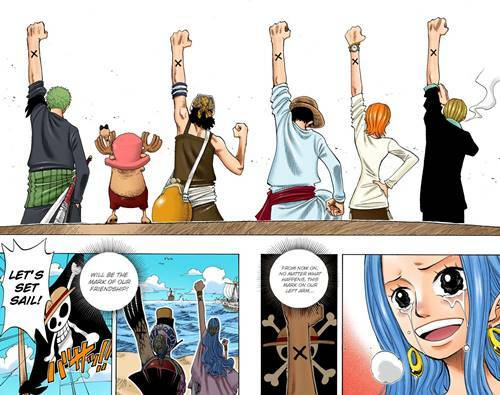 A simple gesture yet it is so memorable, when the Strawhat pirates raise their hands in silence (with X mark at his hand as a sign of friendship), to prevent Marine know their relationship with Vivi and Karu. The two later replied and raise their arm too. One of the most recent One Piece story arc is Totto Land arc (known also as Whole Cake arc or Big Mom arc). It is the main base of Yonkou, Big Mom. This arc is the first story arc with Yonko as the main antagonist. In this arc, Luffy and his ally try to bring back Sanji who forced to arrange in wedding with Big Mom’s daughter, Charlotte Pudding. Indeed, Luffy don’t beat Big Mom this time, but he take down her two main commanders – Charlotte Katakuri and Charlotte Cracker. Other party involved in this arc including Germa 66, Firetank Pirates, Caesar Clown, Sun Pirates and tea party invitations. One of the early One Piece arc and also fan-favorite. In this story arc, Luffy and co must save Nami’s village from the tyranny of Arlong pirates, a pirates crew with member of fishman. This arc also the first time we learn about fishman. The most highlighted moment in this arc (and probably in One Piece series as a whole) is when Nami cry and Luffy give his hat to her and then the four Strawhat crew – Luffy, Zoro, Sanji, Usopp – walking to Arlong Park. Seriously, how can they make an epic moment with only four people walking? Those are list of One Piece all arcs and top 10 best One Piece arc ranked in order of greatness. Some of the favorite One Piece story arcs among fans such as Enies Lobby arc, Marineford arc, Dressrosa arc and Skypiea arc are included too.